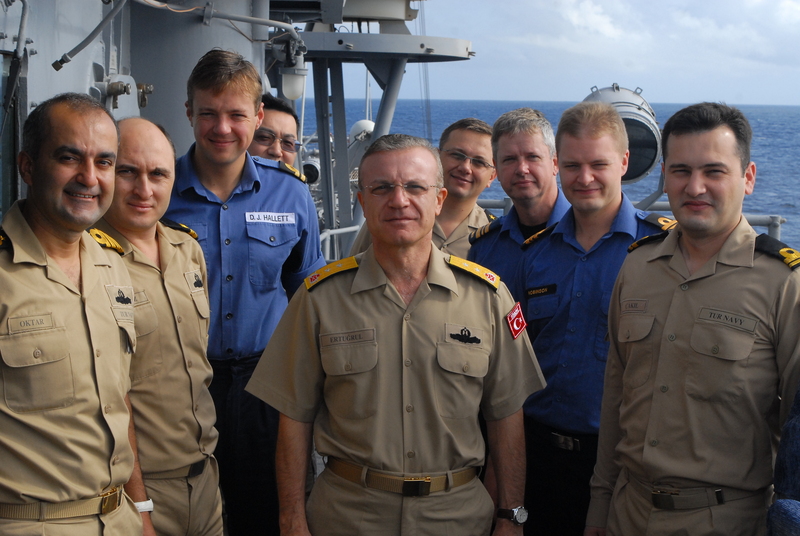 Rear Admiral Sinan Ertugrul (centre) and his command staff, drawn from the Turkish, Canadian, British and US navies. (Photo: TCG Gaziantep). ﻿﻿For the past three months the Turkish Navy was at the helm of Combined Task Force 151 (CTF-151), the multi-national counter-piracy mission of Combined Maritime Forces (CMF). A small but dedicated team of international naval personnel was embarked aboard the flagship TCG Gaziantep to join task force commander Rear Admiral Sinan Ertugrul and his command staff, the majority of whom were drawn from the Turkish Navy, with the senior officers having attended the prestigious naval college in Istanbul. “The flag staff are essentially a floating headquarters“, said Captain Rafet Oktar, the CTF-151 Chief of Staff charged with bringing together the various command and control functions. “We coordinate the various elements of the task force such as ships and aircraft, we plan current and future operations and we provide specialist advice to the Commander“. Lieutenant Commander Scott Robinson of the Royal Canadian Navy was responsible for planning the task force’s future operations. This involved cooperating with NATO and EU Naval Force, both of which also have ships undertaking counter-piracy operations in the region, together with independently deployed navies. “My role involved looking ahead and planning the task force’s operations, by deciding where ships needed to be. In any one day there may be twenty or more naval vessels conducting counter piracy operations in the region, so I spent a lot of time liasing with other organisations and navies to cooperating our presence to provide the best possible effect“, said Lt Cdr Robinson. Piracy is a problem that crosses national boundaries and touches upon issues relating to the law of the sea and human rights. US Navy Lieutenant Mark Richardson was on hand as Rear Admiral Ertugrul’s legal advisor. “It is vital that our task force strictly adheres to established international law and national rules of engagement“, said Richardson, adding, “My role was to ensure we do not stray from those standards“. Petty Officer Wesley Square, also from the US Navy, is a CENTRIX computer technician. Normally based with Coalition Communications at CMF headquarters in Bahrain, Square’s role was to provide ongoing technical support for the operation of communication equipment and networking capabilities between the flagship, task force and partner organisations. “Over the past three months CTF-151 has included ships from seven nations and there are many other countries and organisations also involved in counter-piracy, so communication is essential to how we work out here“, said Square. The Public Affairs Officer completes the international contingent. Lt Dan Hallett of the British Royal Navy fulfilled this role for the duration of the deployment, with Lt Jeremy Olver of the Royal Naval Reserve taking over for the final stage. “We live in an era of fast moving, 24 hours news and media interest in piracy is high. The international nature of piracy also makes it important we build awareness with regional partners and the shipping community. For both these reasons public affairs is an important consideration in task force operations“, said Lt Olver. RADM Ertugrul said “I was proud to lead an international staff, at the head of an international task force, patrolling international waters. CTF-151 is effective as a force for good in the region precisely because of our mutual understanding, cooperation and shared commitment to tackling the serious problem of piracy“. “My international staff added to the diversity of my command team through the backgrounds, experience and abilities they each brought with them. In turn, it was also an opportunity them to hone their skills further through cooperation with my Turkish staff“. 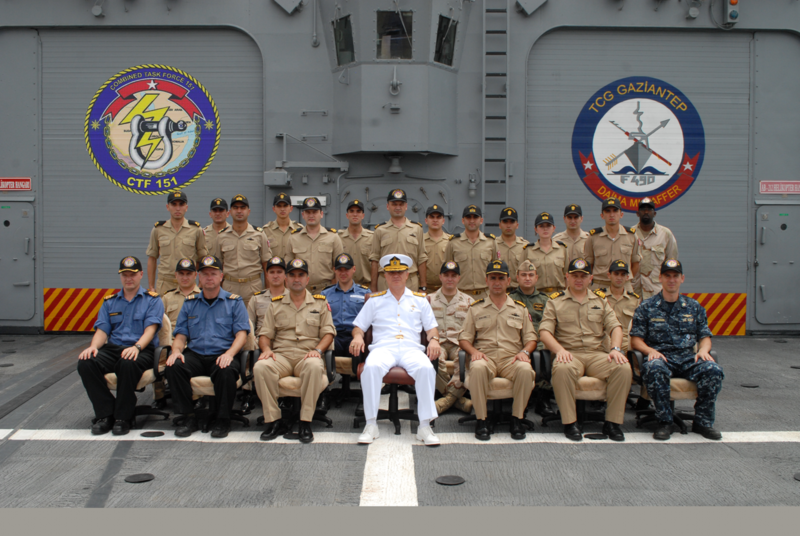 CTF-151 was established in January 2009 as a multi-national counter-piracy task force. Turkey took command of CTF-151 from the Republic of Korea at the beginning of September 2010. Since then the task force has at times included ships from Australia, Republic of Korea, Pakistan, Singapore, Turkey, the UK, U.S. and, for the first time, Thailand. Most of the work of CTF-151 is undertaken in the Gulf of Aden – one of the world’s busiest shipping lanes – and in the Somali Basin. However, CTF-151 flagship TCG Gaziantep also made important visits to Port Victoria (Seychelles), Mombassa (Kenya) and Dar-es-Salaam (Tanzania) in order to strengthen regional partnerships. Command of CTF-151 has now passed to Commodore Abdul Aleem of the Pakistan Navy.